Today I spent the day and I mean the ENTIRE day getting ready for Thanksgiving. Even though I had planned to craft for an hour, that never happened! How I wish I had more time to craft, read a good book and learn a new skill. Seriously, at the end of the day I'm so thankful to finally sit on a comfy couch and write. "Better Not Pout" - Adorable! I love the Christmas design. "Silent Night "- Perfect for anyone who is a fan of the movie Frozen. "Merry Christmas" - The candy cane style design is fabulous and is the perfect welcome sign! Make sure to check out Cheval Crafts for your Christmas decor needs! Now onto the giveaway! One lucky person will win the Better Not Pout Wood Block Set. You can enter below. Don't forget to read the terms and conditions. 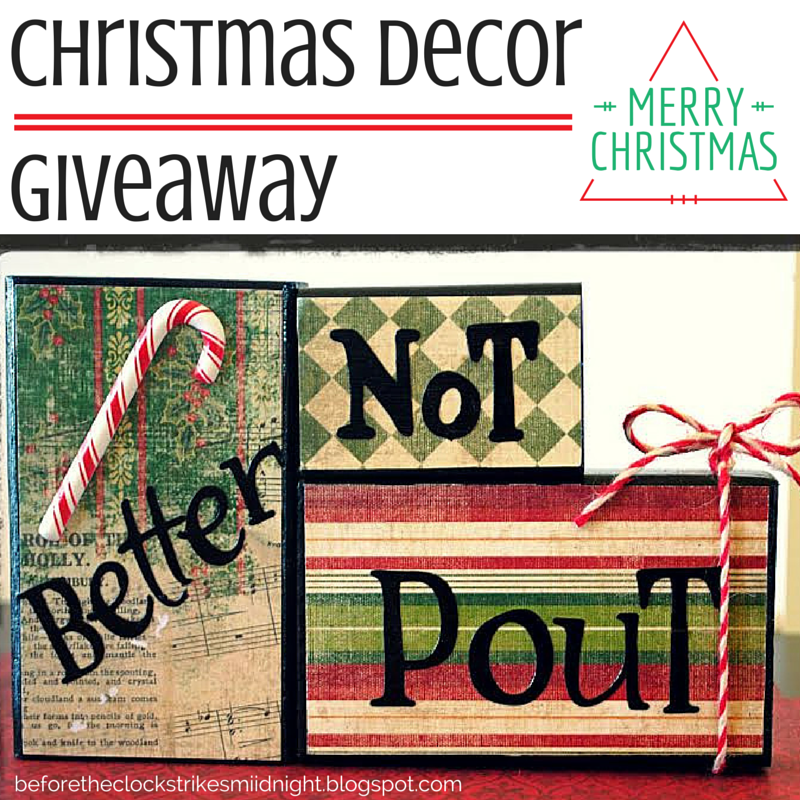 The winner will receive (1) Better Not Pout Wood Block Set from the Etsy Shop Cheval Crafts. Anyone wanting to enter must live in the United States and at least 18 years old. Refer to the giveaway for details on the opening and closing dates. The winner is chosen randomly and will be announced two days after the giveaway closes. The winner has 48 hours to respond or the prize will be given to another person. I was not compensated. All thoughts and opinions are my own. I love the Rustic Christmas Wood Block Set! I love them! Thanks for linking!